In an unpublished decision in the matter of T.M. v. R.M., A-4724-16T3 (App. Div. April 5, 2018), the Appellate Division considered a plaintiff’s appeal of the trial court’s denial of his motion to modify his alimony and child support obligations based on changed circumstances. At the time of the parties’ divorce, the plaintiff was earning a salary of $100,000 per year as a limited partner with OTR. In 2011, plaintiff lost his job and was unemployed for eighteen months. The plaintiff became employed again in 2012, earning $38,400 per year. At the time of divorce, defendant was attending nursing school. 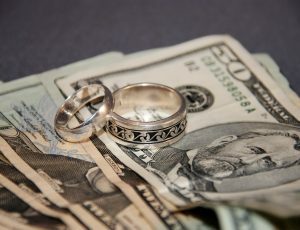 Pursuant to the parties’ Marital Settlement Agreement (MSA), the plaintiff agreed to pay the defendant $3,000 per month in permanent alimony, and “$1,000 per month payable twice a month in child support.” The MSA stipulated these figures were based on plaintiff’s yearly income of $100,000, and no income for defendant. The MSA also obligated plaintiff to pay defendant seventeen percent of his annual gross earnings exceeding $100,000, and maintain medical insurance. The MSA stated defendant was working toward her nursing degree, and was expected to graduate in December, 2013. The MSA anticipated defendant would become employed because it stipulated a review of spousal support would occur one year after defendant’s graduation. The MSA stated if defendant did not complete her education, an income would be imputed to her. In 2015, the plaintiff filed a motion seeking modification of his alimony and child support obligations. The Plaintiff argued that he had experienced a permanent change in circumstances as a result of the change in his income. Specifically, the plaintiff stated he earned $38,400 in 2014, $43,000 in 2015, and that he expected to earn $50,000 at the time of the hearing. The plaintiff also argued the parties’ MSA provided for a built- in review period tied to defendant’s attainment of a college degree and job. In addition, plaintiff argued a reduction in child support was warranted because one son had completed college, was employed full time, and was thus emancipated; their other son had entered college. Nevertheless, trial court denied the plaintiff’s motion, finding that the plaintiff had not established “changed circumstances” warranting a modification of alimony or child support. The Appellate Division’s reasoning depended on the seminal case in New Jersey on modification of support obligations: Lepis v. Lepis, 83 N.J. 139, 151 (1980), which allows for a potential modification of support based on a decline in the payor spouse’s income. Additionally, in New Jersey, “a payor spouse is as much entitled to a reconsideration of alimony where there has been a significant change for the better in the circumstances of the dependent spouse as where there has been a significant change for the worse in the payor’s own circumstances.” Stamberg v. Stamberg, 302 N.J. Super. 35, 42 (App. Div. 1997). The proper inquiry is “whether the change in circumstance is continuing and whether the agreement or decree has made explicit provision for the change.” Lepis, 83 N.J. at 152. In addition, where the question of emancipation is a legal issue that occurs when the dependent relationship between a parent and child is over. Dolce v. Dolce, 383 N.J. Super. 11, 17 (App. Div. 2006). When a child is, therefore, emancipated, “the parent relinquishes the right to custody and is relieved of the burden of support, and the child is no longer entitled to support.” Filippone v. Lee, 304 N.J. Super. 301, 308 (App. Div. 1997). Whether a child is emancipated is a fact sensitive analysis. Basically, a court examines if a child has moved “beyond the sphere of influence” of his/her parents, and the child has an independent status of his/her own. Id. Therefore, a court will look at the circumstances surrounding the child’s needs, interests, independent courses, the family’s reasonable expectations and financial ability. Dolce, 383 N.J. Super. at 18. Another potential change in circumstance can occur even when a child is not emancipated, but lives away from home for much of the school year to attend college. That may require either an increase or decrease in college. Jacoby v. Jacoby, 427 N.J. Super. 109, 122-23 (App. Div. 2012). The Child Support Guidelines do not apply to unemancipated children over the age of 18 and, therefore, there is no formula as to how much child support would be in this situation. Unless the parties have an agreement otherwise, a court has to assess the statutory factors in N.J.S.A. 2A:34-23(a) to determine the child support obligation. Additionally, as reflected in the parties’ MSA they clearly contracted for a review of plaintiff’s alimony obligation one year after defendant obtained her nursing degree and had an opportunity to become employed. The MSA also provided for an imputed income to defendant after December 2013, regardless of defendant’s graduation from nursing school. Finally, the parties’ oldest son was twenty-three years of age, had graduated from college, and was employed full time, and the parties’ younger son had entered college and was no longer living at home, all of which constituted a change in circumstance requiring a plenary hearing to establish the present needs of the child in college utilizing the factors set forth in N.J.S.A. 2A:34-23(a). This case illustrates how a case often has a myriad of factors coming together at once that can affect alimony and child support and the variety of situations that can arise that can affect alimony and child support obligations and the many circumstances in which alimony and/or child support obligations can need to be reviewed.